Do you suffer from chronic, severe headaches? Headaches are common but definitely not normal. Perhaps they do not happen often. However, pain is so bad that you cannot do anything when they do occur. These headaches greatly decreases your quality of life. They could be more serious than you think. Your headache could actually be a migraine which is a neurological condition. How do you know if you have a migraine? These type of severe headaches last around 4 to 72 hours. They are located generally on one side of the head and feel like it is pulsating. Most of the time the pain is severe enough that you have a difficult time focusing at school or work. It is possible that you either feel nauseated to the point you could and do vomit. It is also possible that bright lights and loud noise makes the migraine even worse. People sometimes can feel a migraine headache come on where their vision gets blurry. What do you do when you have a migraine? The most common and typical treatment for migraines are pharmaceutical drugs. Many people have tried identifying provoking factors like caffeine, alcohol or tobacco that could set in motion another attack. Even more have tried reducing the amount of stress in their lives with relaxation techniques, exercise and regular sleep. Have you looked to the spine for the cause of your migraine? While all of the familiar treatments could temporarily help your pain, they may not go to the source of problem. The migraine could be from a spinal misalignment. 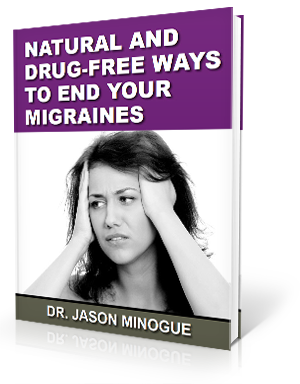 Dr. Jason Minogue is a trained expert in migraines. He is a specialist on the upper cervical area of the spine which is located at the top of the neck. These neurological symptoms can occur when the structure of this region of the spinal column is out of position. Dr. Minogue can determine if a misalignment has occurred with a through exam that includes specific x-rays, structural analysis and other exams performed in the office. He has had great success with these types of headaches and is ready to accept your case. Your problem has an answer. 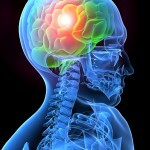 To learn more about the connection between head and neck injuries and migraines download our complimentary e-book Natural and Drug-Free Ways to End Your Migraines by clicking the image below. Ferri, Fred. Headache, Migraine. Ferri’s Clinical Advisor, 2012 ed. ; 429-430.